Content marketing is no longer just a buzz word within the world of marketing, and if you’re still not taking it seriously in 2019, then you really need to be. Content is just as important as any other aspect of your marketing efforts, and despite several warnings over the last decade, marketers are still not taking it seriously enough in 2019. Did you know that only 37% of B2B marketers and 38% of B2C marketers have a documented content strategy? A further 38% and 36% respectively, said they have one but it’s not written down. What’s the point in having one if it’s just stored in your marketing manager’s brain? If you’re asking yourself, what is a documented content strategy, you really need to keep reading this blog post. It’s not good enough anymore to constantly churn out mediocre top-of-the-funnel stuff and create quick, unedited pieces of content. You need to strategize and create something much more worthwhile. And you might not like to hear this, but this will take time. You should have at least one employee, if not a team working on the content you’re creating. You must allocate appropriate time to not only devise a content strategy but to also create the content. Sometimes, the CEO’s and head management can overlook time and expect content to be created in no time at all. Yes, we all have deadlines to work to, but by creating a clear content strategy; the entire team will know roughly how long it will take and when to schedule campaigns. And believe me, this helps A LOT! It means we’re all singing from the same hymn sheet. The Graphic Designer knows when to expect content to be designed, the Marketing Executives know when to schedule the campaigns for and the Marketing Manager knows how everything is running and if we need any further help. Not only that, it keeps us focused and lets us compare and contrast previous quarters. This helps us see real results, and see what’s working well and what we need to improve on. Analytics and marketing metrics play a vital role in developing your content strategy. It’s not something you work on once and then boom, you have it forever. It’s something you will continually work on over time with your team and create the best possible strategy you can with the information and insights you have around you. Buyer personas are fictionalised characters that represent your ideal customer. Who do you want to sell to? These guys! They might be a range of different people, which is fine, we have 6 different personas here at Zymplify. 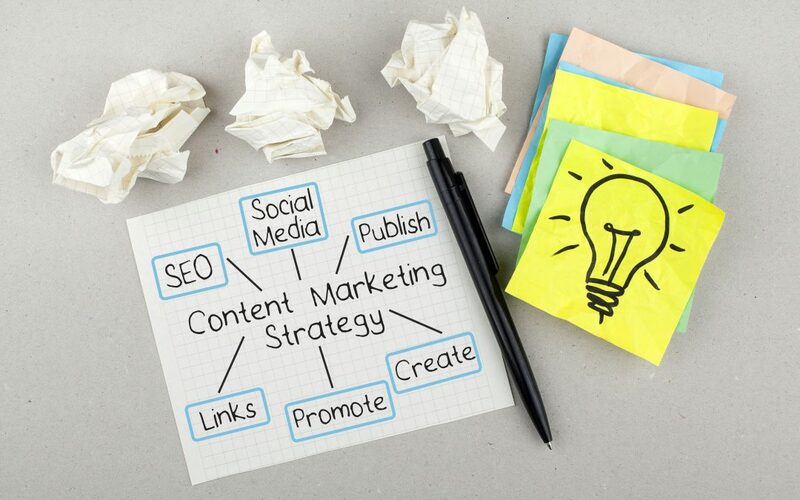 The reason your content strategy starts by creating them is that they should be at the forefront of all your content marketing efforts. These are the people you are writing for and you can solve their problems. They are typing keywords into Google that will (hopefully) link to your website. So, they’re pretty important in the grand scheme of things. You need to know them inside out. You need to know their demographics, their buying behaviours, their likes/dislikes want and needs – everything! The more you know, the better you are at creating content that will attract them. The next step is to create a buyer’s funnel. This is where you will watch your leads move from the first click on your website to the final conversion. You can create a visual representation of the customer’s journey from their very first interaction, right through to close and store all this information in one place. This will ensure your entire team are working towards the same goal, and you can see where the bottlenecks are. You will be able to monitor how quickly you can move leads through the different stages of the funnel, or see where the blockages in the chain are. Now that you know who you’re writing for, and how many different buying stages your business needs – you can create content for each individual group at every stage of the funnel. This might seem like a lot, but this is where you will see your ROI and your marketing efforts skyrocket. If you take the time to create personalised and highly targeted content for each stage of the marketing funnel, you will reap the rewards tenfold. Some content marketers can get so caught up in creating TOF content like blogs and How-to guides, they forget about the middle and bottom stages of the funnel. A huge problem for content marketers all over the world is storing your content in one place, and repurposing it time and time again. If you’re working in a big team, with different people from different departments helping you create content, things can end up everywhere. Content can be stored on different computers and you have no clue where everything is. This can make it really difficult to repurpose content and use it again. Repurposing content is one of the beautiful things about content marketing. Just because you wrote a blog post on a topic and it went down really well, doesn’t mean it just stops there. You could save yourself and your team a bucket load of time by recreating this and turning it into a YouTube video, a podcast or develop it further and turn it into a How-to guide. However, you need a really great storage system to see exactly what you’ve got. A complete Content Management System will allow you to manage, organise and repurpose all your best content. Analytics is what drives us on in marketing, and they have never been more important than now. Every audience is different, and one piece of content might work really well with one of your buyer personas, but it’s not picking up much traction from another. That’s ok. But being able to see this will help you create future campaigns. If you know what’s working, and what’s not, you’ll be able to create bullet-proof campaigns in the future and turn your content marketing into a lead generation magnet.